Edward Oakley Thorp is a professor of mathematics, the author of many books and articles, a blackjack gambler, one of the 7 initial members of the Blackjack Hall of Fame and a manager of hedge fund; he is known as a creator of card counting at blackjack. So, it is highly recommended to get acquainted with Thorpe biography, as it is full of interesting events and facts which may be very useful for blackjack gamblers. Date of birth: the 14th of August, 1932, Chicago, the USA. 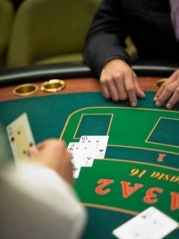 How blackjack card counting was born? The idea of mathematical model to beat casinos at blackjack takes an important place at Thorpe biography: it came to him when he worked at MIT: he thought of the fact that each player could count cards that he received and, as a result, guess what cards were left in a deck. So, why not to determine the variant for each card combination a player could have during a game? Blackjack is not the game of just luck but also mind, so it is clear, that it is really possible to foresee possible card combinations of this game. So, the idea was born: it was really simple and obvious, but Thorp understood it was not so easy to make it a reality. He should first prove that such a system will work and only then he would have a chance to introduce this card counting system to the society. Edward Thorp began to use an IBM computer for his researches and a little bit later it was a time to try using his theory in practice. He went to casinos of Las Vegas, Reno and Lake Tahoe and played blackjack using his card counting system: Edward Thorp had $ 10 000 and he was able to win $ 11 000 in one weekend. Well, the system really worked! Though he was banned from Las Vegas casinos premises, Thorp clearly understood it was a time to share his researches with people. 1962 had become a memorable year for all blackjack gamblers: the book of Edward O. Thorp Beat the Dealer was published and became a national bestseller at once. The book clearly described the whole card counting system by using mathematics and one’s mind, what made it a strong weapon against casinos. This book was republished in 1966 because the first edition was not very easy to apply to live casinos: Thorp changed his card counting system a bit, and after republishing Beat the Dealer he became a real authority in the world of blackjack. Edward Thorp is the author of many books and articles not only on blackjack but also the topics of mathematics, statistics, theory of probability etc. His most known books are: Beat the Market, The Mathematics of Gambling, Elementary Probability. Thanks to his knowledge of statistics, Thorp has been having a success in the stock market since 1960s: he explores different price changes and he was able to make a great fortune out of this. Today he is the President of the hedge fund Edward O. Thorp & Associates.